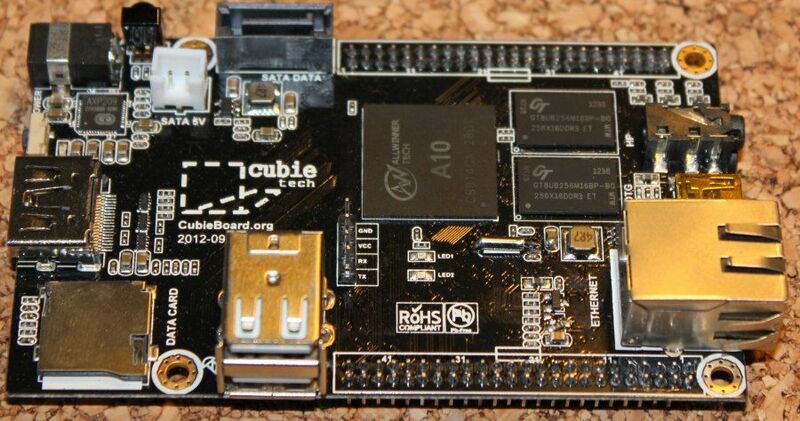 Cubieboard is one of many mini computers with ARM processors. This one is equipped with Allwinner A10 processor with Mali400 GPU - a very common chip among entry-level tablets and smart-phones. We also get 1 GB or RAM (480 MHz DDR3), 100 mbit Ethernet, two USB2 ports and one SATA port. There is also 4 GB of NAND Flash holding Android system (4.0) and a slot for micro SD cards to run other operating system like Linaro Ubuntu. Priced at $49 it's one of cheapest boards available. It's bit more than Raspberry Pi, and less than stronger dual and quad core boards. If you want to buy it the quickest way would be through ebay from China. It should be better than Raspberry in term of performance, but lower popularity and limited amount of addons makes it less usable. Is this board worth the effort? The board has an Allwinner single core A10 CPU of ARMv7 generation which should be faster and should run more software than ARMv6 CPU in Raspberry. 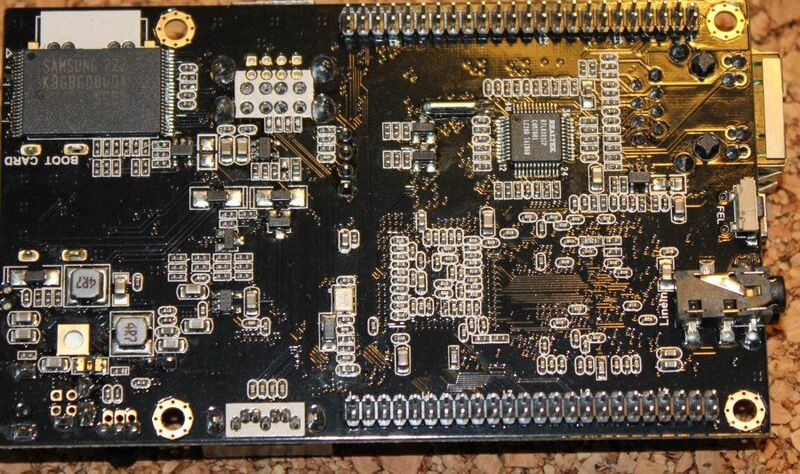 There are also 96 expansion pins, that allow a lot of hacking with the board. We also get a 1 GB of moderately fast RAM. The key feature is the SATA port allowing to connect a typical HDD to the computer without any problems. This gives a big storage drive that can contain a lot of movies or songs. Cubieboard is priced accordingly to features it gives. 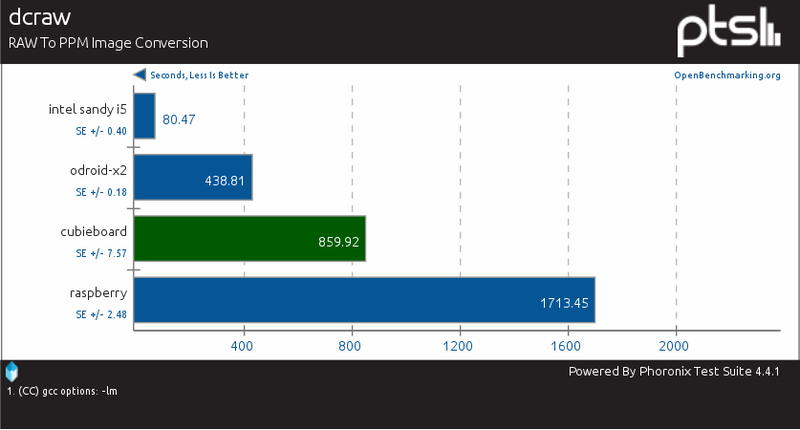 More than Raspberry but less than quad or dual core newer processors and boards. After connecting the power the board will boot Android 4.0 (4.0.1 in my case) from the internal Flash memory. What's nice is that it has Google Play application so you can start installing apps straight away. For most other boards you have to install Google Play manually. 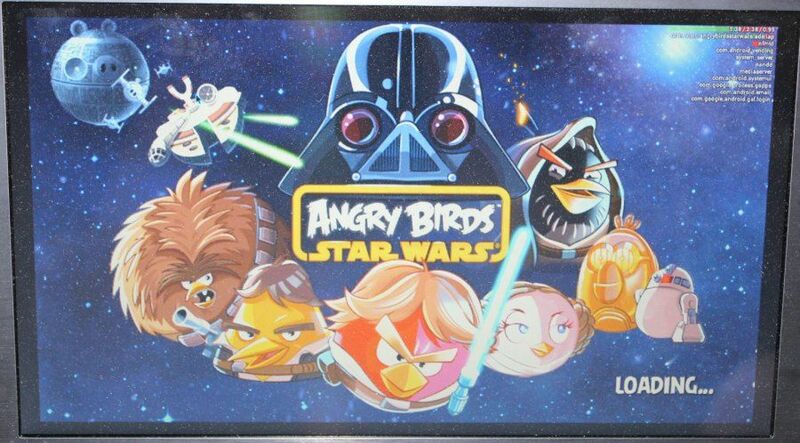 The system was quite responsive and it had no problems with Angry Birds or movie playing. 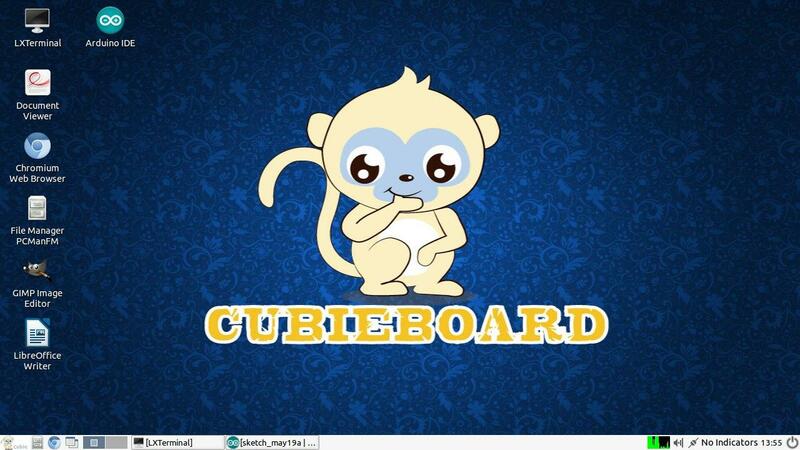 From cubieboard webpage we can download Linaro Ubuntu image which we can burn on a microSD card. This will give us a LXDE base Linux desktop. The system is more responsive than on Raspberry Pi. The packages install faster and the desktop in general is bit faster. 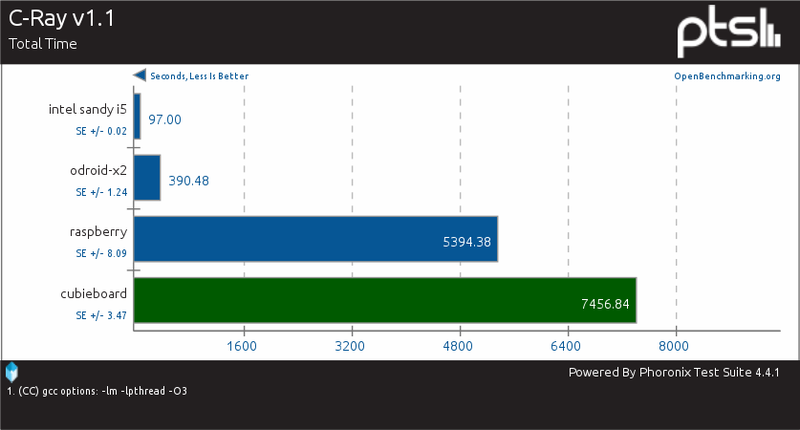 However it's still quite easy to lag the system when starting bigger apps or when doing some basic tests, benchmarks. Also it seems to have less repositories than for example Linaro Ubuntu for Odroid X2. There is also ArchLinuxARM available, but I didn't test that system. When using Linaro Ubuntu on Cubieboard I've managed to somewhat hand the system few times - probably from overheating the CPU. The CPU usage was low, and the system wasn't responding to actions (not starting up new apps, or closing open ones). When I put a fan blowing air on the CPU (that was very hot) the problem did not showed up. So it may be a good idea to put a RAM radiator on the CPU to improve its cooling. The computer uses USB power supply to work (powered from USB port of other computer or from USB 5V power supply). The power can be connected via mini USB port or via power plug (you get USB - power plug cable with the board). 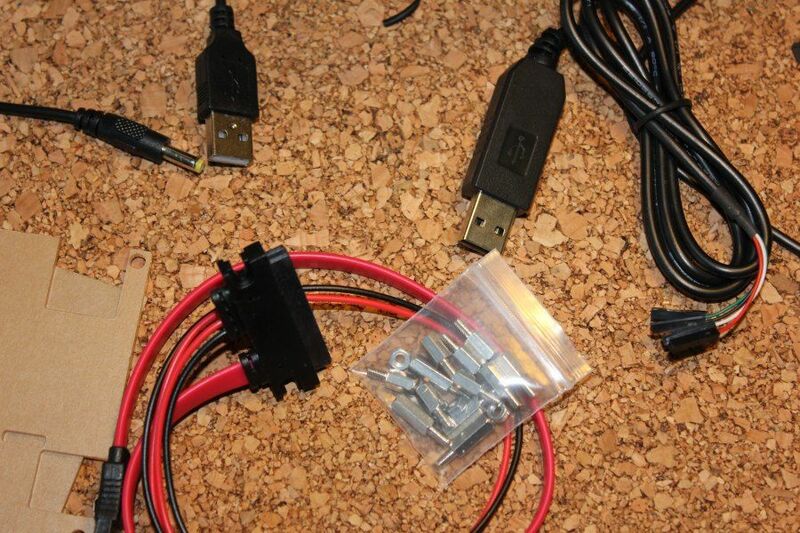 To connect a SATA HDD you can use the provided special cable - that has the SATA connector for data and a two pin connector for power. When powered the board will look for microSD card and boot the system on it. If there is no microSD then it will boot Android from the Flash storage. When I tested Cubieboard I used Atrix Lapdock - display and sound via HDMI plus keyboard and touchpad via USB. It worked nicely for Android (with cursor and keyboard support) and for Linaro Ubuntu. For other tests the Allwinner A10 was either slightly better or more than twicely better than Broadcom chip in Raspberry. Newer ARMv7 CPU generation and higher clock rate should give better performance for all tests. However benchmarks yield varying results. Things like different GPU may affected them. Either so it's still not the best thing for a typical desktop, it's good for movie, music player or for some electronic hacking. Cubieboard is a quite cheap board. It's not very fast or popular. It key selling point is probably the SATA port, handy for multimedia usage. Electronic, ARM, Android hackers may find all of Cubieboard pins very handy. People interested in the Raspberry buzz wave should rather pick Raspberry as it will be easier to start with, find help from the community or get various dedicated addons.